I have a RCT6303W87M (RCA Viking Pro) running Android 6.0 with a MediaTek MT8127 4 core CPU clocked at 1.3Ghz with a Mali-450 MP4 GPU. It has a definite data connection, yet it still won't connect to servers. 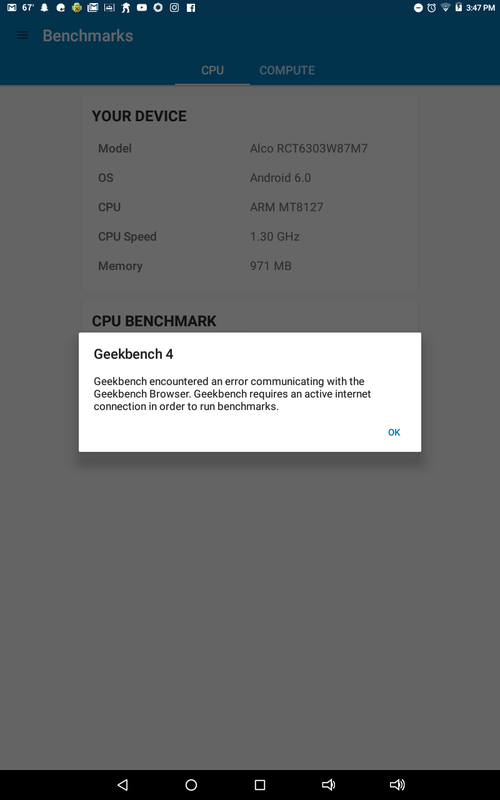 I know some have had this problem with the LG G4, yet this is a completely different company. It'd really be helpful if I could get some help on this. Thanks for your message. I apologize for any inconvenience this issue is causing you. I have logged this issue with our development team and I will follow up with you as soon as we have any more information about what's going on! What sort of error message are you receiving? This is all I get, no matter what. Thank you for the screenshot, it will be helpful! As soon as I have more information about the issue, I will follow up with you. Our development team has been made aware of this.